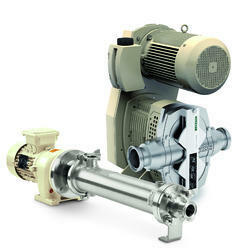 Our range of products include sanitary pump and sanitary pumps. NETZSCH Sanitary Pumps are employed in the food products, pharmaceutical, cosmetic and chemical/biochemical industries for sanitary applications and optimal cleaning. The important capabilities include, the continuous, pressure-stable, gentle and low-pulsation pumping and metering in proportion to speed. The block pump construction with flanged drive is particularly compact and economical to operate. Various regulatory agencies have set specifications for a hygienically correct configuration of components and machines, as well as for component cleanability. NETZSCH PUMPS® are designed, produced and inspected in accordance with the regulations of the EHEDG (European Hygienic Equipment Design Group) and the QHD (Qualified Hygienic Design). The materials used are approved by the FDA (Food and Drug Administration) and the BfR (German Federal Institute for Risk Assessment). In addition, NETZSCH® Hygienic and Aseptic Pumps meet the 3-A Sanitary Standards specifications of the United States and are GOST-R certified (a Russian certificate of conformity).